The design phase is one step in a roofing project, but a crucial one. Your design lays out what customers can expect in their new roof. In essence a design plan is a promise, and you don’t want to make promises you can’t keep. At the end of a roofing project; unkept promises can motivate dissatisfied customers to file against your contractors’ insurance; specifically your general liability coverage. What is the cost of the roof in relation to the budget that you have been alloted? What are the roofing requirements of the structure? How does its location affect the structure? What climatic conditions is the structure subject to? What elements make the roof structurally sound? What measures prevent leaks, wind damage, etc.? What choices are considered “aesthetic” and can be altered to lower price? What man-hours are involved in each phase? By reviewing the components of the roofing process with your clients, they can make a more informed decision on how they want to proceed. The roofing requirements vary depending on the style, size, use and other factors. The size of a roof ranks as a chief factor in determining what the price will be. Square footage may not always yield the highest cost. Whether a structure is denoted as a building versus a home will not only influence the dollar value of its roof but also what type of construction is needed. 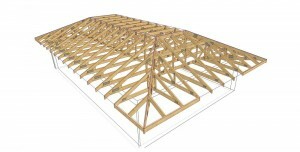 Ballast roof are used in a lot of commercial construction. While low-sloping roofs are the norm in the sun-belt states, the North is populated by steep roofs. These systems can be manipulated to suit various style roofs: gable, mansard, hipped, saltbox and A-frame to name a few. The more complex the roofing system the more shingles required to cover the space. Location! Location!Location! is the mantra for real estate brokers and should be the mantra for roofers. If your putting a ballast roof on a Los Angeles office building, you may want to create a green space on the roof to reduce heat island effects. If your down South constructing a roof on a house in a tree-shaded, humid area; you may want to install shingles that are embedded with copper that destroys moss and algae. You may want to protect your New England homeowner’s gutters from being clogged up by all those falling autumn leaves. Make sure shingles are tightly attached, so there is no leakage onto the underlayment. Install flashing in an airtight manner to prevent wind damage. The perimeters of chimney, plumbing and attic vents must be tightly encased in waterproof materials and substances to assure protection against water. Eaves must be equal to disposing of the amount of water they intake. Old eaves need to be replaced. Dormers need to include outdoor drainage like gutters. Roof valleys are natural receptacles of water because of their deep V shape. A number of diversion systems are in use to offload the rainwater. Water collection systems are being used as one of the diversions for roof valleys because of the volume of water stored in that part of the roof. Making sure all roof components are tightly secured is your best protection against wind damage.